Posted on January 11, 2010 under Economics. I was reading this fascinating article on Visa, which showed how incentives along with competition can actually raise prices instead of lowering them. I was wondering about how incentives may work in everyday life, when I realized that I see one such example in action every day. Of late, I have had to change the route that I take to get home from work in the evenings, because of heavy traffic and work on the Mumbai Metro. So I usually walk a short distance to a point where I can catch a Bus or Auto-Rickshaw to Jogeshwari station. Now, there are two primary routes to the station. Route A is about 2 km long and the fare usually comes to Rs.16-20 on this route. Route B is about 1.8 Km long and the fare usually comes to about Rs12-15. 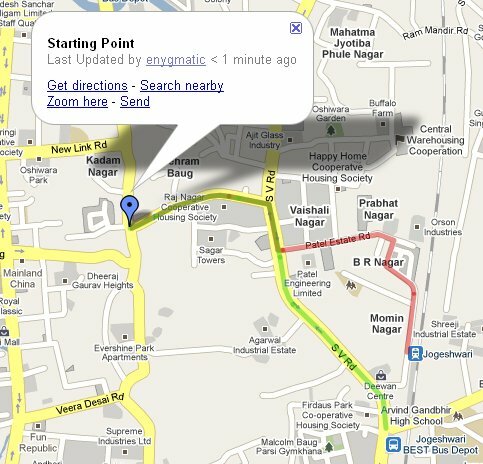 See the Google Map below for an idea of how the routes run to Jogeshwari station (Route A in Red and Route B in Green). Now you have two options to get to Jogeshwari station, besides the bus – hire an auto-rickshaw or share one. There are two perspectives in the transaction of hiring an auto-rickshaw. From your perspective you would like to get to your destination in the least possible time and running up the least possible fare. From the driver’s perspective, he’s in the business of maximizing his revenues, so he’d like to extract the largest possible fare from you for the distance. So, you will find that more often than not, the driver has a tendency to take you along Route A. In fact there are several instances where I’ve had to correct the driver and insist that he go along Route B. On the other hand, when you share an auto-rickshaw, incentives and behavior change for both parties. Usually an auto-rickshaw seats three people, and generally you pay Rs.5 per head when sharing the auto-rickshaw. Now, as your costs are fixed, you are indifferent to which Route the driver takes as long as he gets you there quickly. The driver however is in a bit of a fix. His revenue from the trip is Rs.15. If he takes Route A, then he doesn’t even break even on the trip (as compared to the usual fare). So his only hope of earning something is to take Route B. Hence, I’ve found that when you are sharing an auto-rickshaw, almost no driver will attempt to take route A and everyone takes Route B. In order to maximize his revenue, the driver will also try and fit in an extra two people into the vehicle taking his total revenue to about Rs.25 for the trip. But he will still prefer taking the shorter distance. I think this small example goes a long way to show how behavior can change when incentives change. After all, people respond to incentives. This entry was tagged under: Economics. Both comments and pings are currently closed.